>I totally agree that every baker should have those certain recipes in their pocket that they can always turn to. 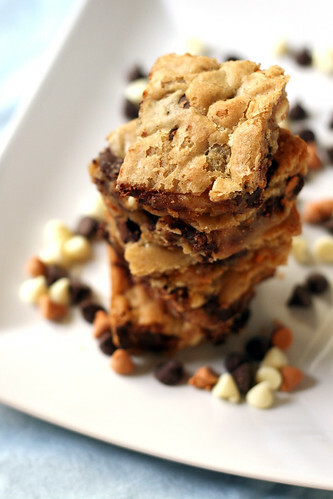 I LOVE blondies because they are so versatile. These look amazing! >so simple to make and they look delicious! >Just finished making your blondies and they're SO yummy! I let them cool for just a short while because I had to try them still warm from the oven, especially with the chocolate all melty…so good! I also enjoy having those one-bowl recipes to have on hand when you want to whip something up quickly. Thanks for sharing a great recipe!!! >OMG…drooling. This would be awesome in an ice cream sundae as well! hehehe. I need these in my life. EVERYDAY! 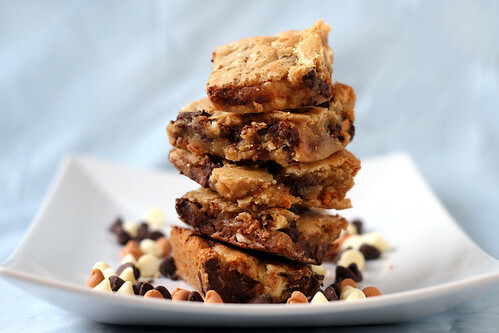 >It's crazy I've never made blondies, but I'm pretty sure I would like them gooey too! >This is FANTASTIC! We've made them three times in the last two weeks. They go really well with some toasted coconut, toasted pecans, and chocolate chips. They are super easy to make and everyone loves them. A total keeper of a basic recipe, thanks!